What is a Recumbent Bike? - Eat. Move. Hack. What is a Recumbent Bike? 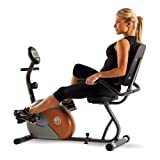 A recumbent bike is a stationary bike that has an ergonomic seat and a backrest. When exercising, it relieves the stress on the back and allows you to sit comfortably when working out. If you want to concentrate on working your legs without hurting your back, then this is an excellent option to consider. There’s a roomy, supportive backrest upon which you can lay back upon. The pedals are out in front of you instead of being underneath. You lay out on the bike, stretch your legs out to put your feet into the pedals and pedal on, getting a great workout. It’s comfortable, but it can also be very challenging. You can even do high intensity interval training on these machines. An upright bike is just that – upright. When on it, you sit upright with all the weight of your body being supported by a small area of your sitting bones. Your chest is close to or up over the handlebars. The pedals are directly below your seat and perhaps only slightly in front, depending on the machine. This position can place a lot of stress on the hips and back due to the lack of support and the sum of your bodyweight being concentrated on the small seat. On a recumbent, your weight gets evenly distributed across a wider area and it takes the stress off the joints. Many people with knee, hip, and back issues prefer to ride a recumbent. Some may think that comfort and fitness just don’t mix, but the recumbent bike is a prime example to prove them wrong. These exercise machines come with cozy, cushioned seats. The reclined position means less stress on the joints and back. It can be a very pleasant experience. However, working out on this machine is a long way from taking a nap. With the many resistance levels and programs, you can work up a heart-pumping, sweat inducing, calorie burn that takes your fitness to the next level with each and every session. Just as with all other types of exercise, you get back what you put in. Though relaxing, perhaps even invigorating, exercising on a recumbent bike can help you produce some amazing results. You can do high intensity interval training using this machine. There are a lot of variables that influence how many calories you burn. Riding on a recumbent for just 30 minutes a day can prove transformational, burning fat, flattening the abs, and even improving range of motion in your joints. These are the reasons recumbent bikes are used often for rehabilitation after injury or surgery. It’s a great, effective way to ease into fitness or take your fitness to a whole new level. There’s a lot more to buying a recumbent bike than knowing how much you have to pay for one. It’s a good idea to first sit down and figure out what features you want and need. You’ll also have to consider your goals. 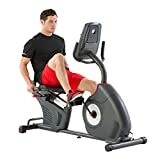 For example, if using a recumbent bike is something you’d like to do long term, then you’ll want one that can accommodate any new levels of fitness you might achieve. In this case, you’d want a bike like the Nautilus R616 or Nautilus R614. These bikes are built to last and come with a lot of programs and resistance levels to accommodate both beginners and advanced users. The Nautilus R616 is a top-of-the-line model that comes with 29 programs, 25 resistance levels, and even bluetooth. The R614 is its budget-friendly counterpart. So what is a recumbent bike? For many, it’s the transformational game-changer they’ve been waiting for. You may find it to be the one aerobics machine that makes all the difference in your fitness.